What Technology Features Come With the Ford Fusion? The Ford Fusion is a midsize sedan that has much to offer consumers, such as innovative features that enhance efficiency and convenience. 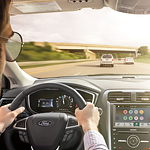 Our team at Woltz & Wind Ford wants our consumers to be informed about our models, so you can read about a few of the Fusion's technology features below. If you choose the Fusion Energi plug-in hybrid, you get EV Mode. This lets drivers choose between gas or electric power, or they can choose a combination of both to power the Fusion. With Auto EV, plug-in power is used until the gas engine is needed. EV Later uses gas power and saves electric power for later use. You can use the MyFord mobile app to monitor and schedule when the battery needs to be charged. The Fusion is compatible with FordPass Connect. This provides you with an in-vehicle Wi-Fi hotspot, which can power up to 10 devices. The hotspot can be accessed from up to 50 feet outside of the vehicle.